South Africa beat Niger 2-0 in their opening 2012 Africa Cup of Nations qualifier in Nelspruit on Saturday. Strikers Katlego Mphela and Bernard Parker were on target at the Mbombela Stadium in the Group G game. 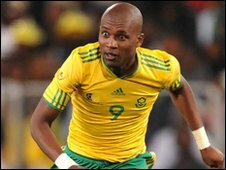 Mphela sent a deft chip over Niger goalkeeper Kassaly Daouda in the 12th minute after a Steven Pienaar pass. Belgium-based right back Anele Ngcongca then crossed for FC Twente forward Parker to score with a right-foot volley just before half-time. Despite its dominance, South Africa failed to add to its advantage, and boost its goal difference, as Daouda made a string of saves in the second half. "We created a lot of opportunities and at the end of the day I think we must be disappointed we didn't take our opportunities," said man of the match Pienaar. "We are really going to need those goals." South Africa had 13 shots on target in their first competitive game under coach Pitso Mosimane. Pienaar was denied what would have been a deserved goal in the 72nd when Daouda dived to his left to deny the South Africa playmaker. The Niger goalkeeper also pulled off sharp saves from Mphela, Parker, midfielder Siphiwe Tshabalala and substitute Teko Modise as Bafana threatened to turn the game into a rout but failed to find the finishing touch. "We'll take 2-0," said Mosimane, who took over from Brazilian Carlos Alberto Parreira following the World Cup. "It can be better. We showed anxiety and nerves in front of goal. It can be better." South Africa will also play Sierra Leone and defending champions Egypt in their qualifying campaign.